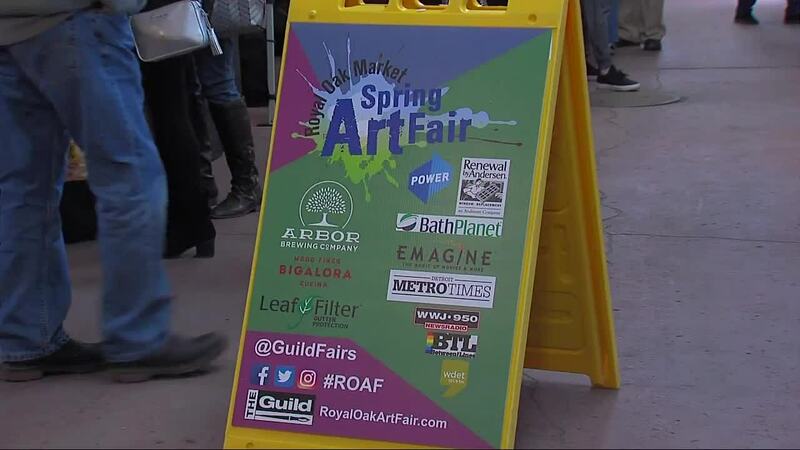 ROYAL OAK, MICH (WXYZ) — The Royal Oak Market: Spring Art Fair officially kicks off the art fair season, featuring 55 artists, many local, exhibiting their latest works of art. The juried fine art fair takes place April 4 & 5 inside the Royal Oak Farmers Market and features a diverse array of fine art mediums including ceramics, painting, photography, glass, jewelry, sculpture, mixed media, drawing, printmaking and more. Admission is free. The Royal Oak Market: Spring Art Fair will open from noon until 10 p.m. both days, making it a great event to enjoy in the evening complete with food trucks (Nosh Pit Detroit and Regina's Food Truck), entertainment brought to you by the Bank of Ann Abor, rustic farmhouse inspired beer from the Brewery Vivant, the world’s first LEED certified microbrewery in Grand Rapids. The Detroit Institute of Arts will also have art activities.